ties with for years in China. 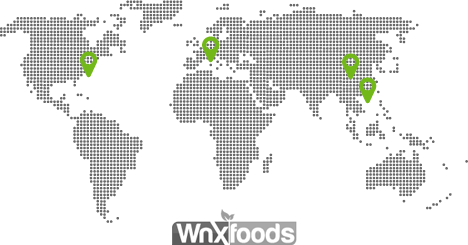 W&X Foods is an international frozen food group. Incorporated in North Babylon, NY, we operate two diversified businesses: Frozen vegetables and Frozen meat. We serve the following markets: industrial, food service, wholesale, and retail. All of our suppliers have been audited by SGS and are in possession of HACCP, BRC, and ISO certifications. From the point of production to the delivery destination, we have a team of knowledgeable staff who’s involved in every stage to handle your shipments. Innovation and flexibility are embedded in our daily business conduct. With high sense of ethics, integrity, and honesty, our dynamic team of professionals works hard every day to find the products of your needs and bring a high level of service. We are committed to your success! © 2015 Copyright W&X Foods International Trading, Inc.